Open educational resources usually target a community of interacting users. The patterns of communication and exchange depend in part on the definition of the community of practice. The language used sets the limits of the potential audience and the profile of the participants involved. The institutional context, professional profile, as well as the reference region also determine the socio-technological design of MOOCs, educational forums and other open educational resources. This module examines how to define and manage meaningful communities of practice. Open educational resources are often made operative through groups of heterogeneous composition (in terms of region of origin, language or values). Teams composed of members from different cultures are innovative and contribute to new approaches to problem solving. However, there is a challenge in getting cohesion and integration in the group, and diversity may contribute to conflict or misunderstanding. In this module, we present the implications of ‘super-diversity’, majority-minority interaction and other forms of intergroup contact. A German university uses Moodle to coordinate the End-of-Grade Work of all final-year students. A private foundation from Jordan launches a chemical engineering course in Arabic, implemented in Sakai. A consortium of North American universities offers a course in social network analysis conducted by one of the leaders of the area, open to participants from around the world. A Chilean university conducts a course in Spanish on the application of social intervention projects in marginalised communities in Latin America. Each of these courses varies in the learning management system, the language, the conditions of access and the group to which it is potentially directed. They not only use different software, but also have a different ‘social design’. Beyond the intention that the course be more or less open, they differ in the community of practice that they have defined and, consequently, the audience to which they are potentially directed. Language is one of the elements that contributes to the establishment of boundaries, since it implies a specific community of speakers. Second, there are institutional or group membership requirements that also delimit the community of practice. In the previous examples, one of the courses requires being a student of a specific university, another requires being a student of the Erasmus programme and another one implicitly requires being part of the stakeholders in the community development in Latin America. On the other hand, regardless of the a priori definition of the target audience, the implementation of the course entails specific social dynamics that determine the accessibility and the final use of the resource. For example, the course on chemical engineering in Arabic can be addressed generally to students from the Maghreb and the Middle East region. However, in practice the type of Arabic used can make students in Jordan or Palestine feel more comfortable with the language used than students in Morocco or Tunisia. The examples of industrial chemistry may be more relevant in one country than in another. Furthermore, the degree of heterogeneity of the participants in the region can influence the type of interaction and the degree of participation that occurs in the forums. In sum, even with the objective of promoting open education, a set of social and institutional factors condition the effective community of practice that finally accesses and takes advantage of learning resources. Cultural diversity influences the performance of work groups. Cultural heterogeneity affects group cohesion and increases the likelihood of conflict. However, it also increases the creativity and satisfaction of the participants (Stahl, Maznevski, Voigt & Jonsen, 2010). These effects occur both between groups with a different national culture, and internally, for example with the diversity introduced by ethnic minorities within a national culture. Logically, there may be differences depending on the size of the group, the geographic dispersion of the group, or the type of management strategies that are developed. Members who have a poorer command of the language have more difficulty in participating, and the group has more difficulty recognising their competences. This not only affects the communication, but also the motivation of the participants. The communication style of each of the participants can be more or less direct depending on their cultural background. For example, an American usually says things more openly compared to a Chinese, who is more likely to use an indirect style of communication. Members vary in the pace of work, the time they invest in debating, or the more or less consensual style of decision-making. This forces participants to adjust the pace and expectations of group work. Imagine the following example: in a MOOC taught by a North American university, groups of students are formed to carry out the tasks of each module. The work is done in a group through a chat tool. In one of the groups, there are 2 Japanese students and 6 North American students. During the meeting of the group, several Americans take the lead and make a proposal that is accepted by the majority. When the activity is to be concluded, one of the Japanese students says that they do not agree with the result and reopen the debate. The Japanese have had less opportunity to participate because they have less English proficiency. When they are building their ideas in English, the group is already addressing the next topic. In addition, they assume that it is important that the group reach a consensus, even if this means more time for debate or a slower pace in the discussion. Therefore, the group faces the dilemma of terminating the task (with the discomfort of two members) or restarting a debate that they thought had ended. 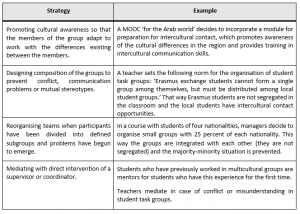 In order to effectively manage multicultural groups, it has been proposed, among other strategies, (a) to recognise differences and face them directly, (b) to modify the composition of the group, (c) to establish certain norms of operation, or even (d) to remove group members, when other options have not worked (Brett, Behfar & Kern, 2006). A Latin American educational network programme video-conferences with several secondary schools. It is a ‘classroom virtual collaboration’ project. Students from Argentina, Chile, Colombia and Ecuador participate in the exchanges, and make presentations about nature in their respective countries and then open a debate on ecology. To facilitate discussion, everyone uses educational material about the environment in Latin America that they have previously selected among the resources with a Creative Commons licence available at Curriki. In addition, through forums in the same community of educators, teachers have selected those parts of the material that coincide in different educational centres and that can allow a shared reflection between participants from the different countries involved. All students participating in the videoconferences are from urban extraction, except the representatives from Ecuador, who live in a rural area and are from the Saraguro minority. Finally, this group hardly participates in the debate, feels excluded and makes negative assessments of the experience. This could be an example of a majority-minority situation, in which the minority group has a secondary status in the interaction. It is a case of intergroup relations, in which the characteristics of (a) differentiation between groups, (b) favouritism towards the group of belonging, and (c) social comparison, sometimes resulting in competition or conflict between groups, are observed. Personalisation. It consists of promoting personal relationships, so that membership in the group loses weight in interaction. In the previous case, informal conversations could be developed among the students before starting the scheduled academic activity. For example, students in Buenos Aires can enter into prior contact via Skype with Saraguro students. Personal exchanges help to break the stereotype that defines them as a homogeneous collective, giving rise to a process of ‘de-categorisation’. This result depends largely on having a prolonged and positive contact. Re-categorisation. It consists of creating and promoting inclusive categories. For example, the category ‘Latin American’ includes the different national categories, and these in turn are subdivided into ethnic categories (as is the case of the Saraguro minority). This is an element that can be handled institutionally in the dissemination of the activity, in the selection of students and in the implementation of the course. Crosscutting categories. It is also possible to use multiple categories, to find common spaces. For example, it may happen that several groups of students differ in ethnicity, but coincide in nationality, religion, associations in which they participate, or in sporting and political interests. Finding cross-sectional categories between Saraguro students and the rest could also improve relationships between groups. The development of positive intergroup relations can facilitate a good use of open educational resources.